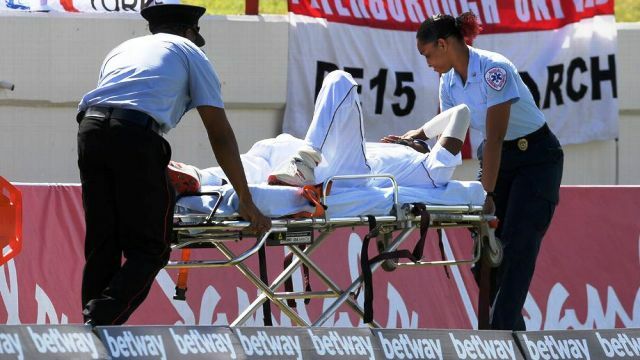 The Windies suffered a significant injury blow on the third morning of the third Test in St Lucia, after Keemo Paul was stretchered from the field. The incident occurred in the fourth over of the morning, when Paul set off in pursuit of a cover-drive. He pulled up ten metres from the rope, and fell to the ground as soon as he left the field of play. He continued to receive treatment behind the boundary as play continued, before being wheeled away and replaced by substitute fielder, Jomel Warrican. According to ESPN Cricinfo, the team announced soon afterwards that Paul had suffered a right quadriceps strain, and had been sent for scans. Darren Bravo has also been sent for scans – he did not take to the field all day after injuring his finger earlier in the match.